Clear Polypropylene - Polypropylene is a thermoplastic polymer. This a scientific way to say it is a moldable plastic that is created through a chemical compound of repeating structural units. Basically, this material is used for protecting your cards because it is durable and unusually resistant to many chemical solvents, bases and acids. Acid Free - No PVC - This is key because neither should be used when protecting a collectible. Acid will obviously eat away at whatever surface it touches and PVC is known to degrade over time when exposed to UV light. This includes cards from 20 - 35pt. This includes cards from 20-35pt. Features heaviest gauge Polypropylene. 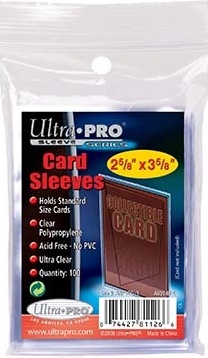 This is the only difference between the basic and premium sleeves. Features special angle-cut top to eliminate damage to corners. Ideal usage for cards to be graded. 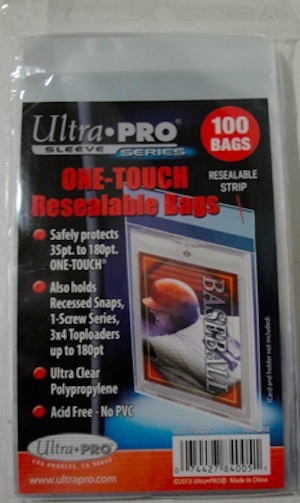 Ideal for jersey and relic cards that are 100PT to 130PT. Ideal for tall boys or other tall cards up to 2-1/2 x 4-3/4 inches. 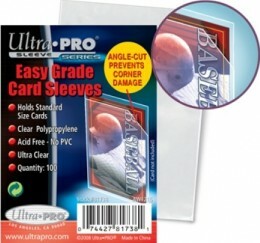 Protect your card cases from scuffs and scratches. Can be used to protect 35PT to 180PT magnetic cases and toploaders. Use the dividers to help organize your collection. Best used to organize cards in storage boxes. 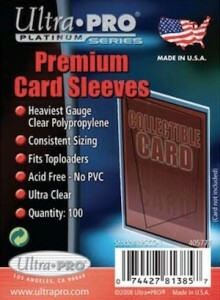 100 Ultra Pro Pokemon Basketball Baseball Trading Card Sleeves ! Fast Ship! 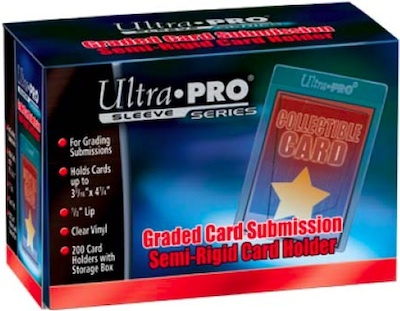 Semi-Rigid card holders appear to be one of the most misunderstood products used by collectors to protect cards. Part of the Sleeve Series, the semi-rigid holders are made of clear PVC (commonly referred to as vinyl) for both strength and visibility. They are meant to be a lightweight and convenient way to transport cards safely. While the holders do offer some protection, they are a temporary solution and are not intended to be used as a final display for the cards. 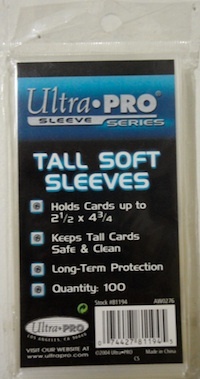 It is highly recommended that collectors put their cards in a soft sleeve before putting them into semi-rigid holders. 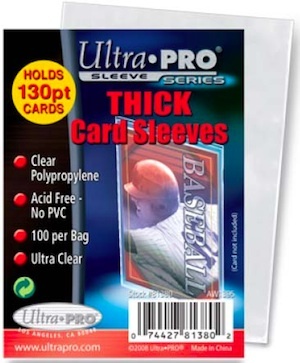 Just like a toploader, these card holders are not meant to hold cards without the additional protection offered by the soft sleeves. Since they are made of PVC, the semi-rigids have the tendency to degrade in heat or light, which can ruin a card. These cases do not offer any UV protection and are not archival grade. The most ideal use for the tall semi-rigid card holders is as a graded card submission in conjunction with the Easy Grade Card Sleeves. Both are designed to make it easier to insert and remove the card, reducing the chance of damage. The taller lip still adheres to the PSA submission guidelines. The regular semi-rigids are great for collectors who prefer the ability to easily flip through their cards with the help of the 1/2" lip, which also makes a great place for labels. The smaller semi-ridges also fit better in the corrugated storage boxes. 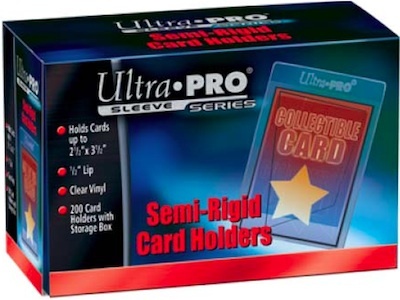 200 ULTRA-PRO SEMI-RIGID HOLDERS CARD HOLDERS - NEW!!! 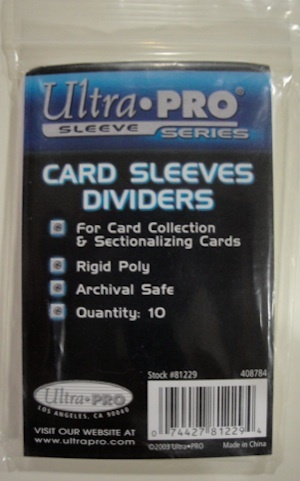 What Ultra-Pro sleeves will fit with the thick relic cards such as the ones with James Bond sets ? Jim Young � I’m not familiar with the size of the James Bond relics but the Extra Thick Card Sleeves noted above are probably a good place to start. Need 400 Card Saver IV ,4 1/2 by 6 1/2.